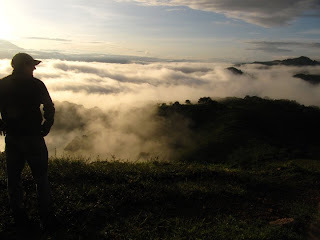 No matter which road you take out of La Unión you are sure to pass coffee fields. Though throughout the year, the sight you see is different. In the summer months, white flowers are dotting these tall jagged-leafed plants. In autumn, green cherries start forming. In winter, colder temperatures prepare red cherries to be picked. And come spring, we see the branches that once held these ripe cherries are empty. After all the red cherries are picked, depulped, washed, patio dried, and machine dried, they’re ready to leave Honduras for selective consumers around the world. 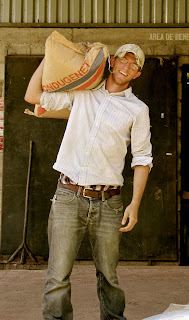 I invite you to purchase a pound or two at microloancoffee.org to taste this year’s harvest. What all this means for Unión MicroFinanza is that we have finally reached the end of year one. Our first loan cycle is now complete. Over the past month, our producers have finished repaying their loans with extraordinary success, and are immediately feeling the rewards of being a UMF client. 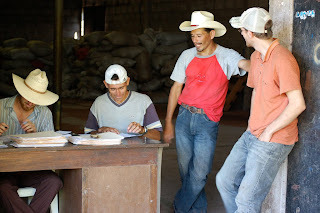 And remember, our producers also include bean and corn producers who value these staple foods as a supplemental income. Our first year is behind us, but the work continues. Life within the organization and La Unión are exciting. Kids are done picking coffee and are heading back to public schools. Groups from the United States are getting ready to visit and finish a church in the village of Quiscamote and build latrines in El Aguila. The UMF staff is busy tweaking the loan application and accounting processes for the upcoming loan cycle. And producers are getting ready to receive more loans for this coming harvest. Producers are doing so by taking advantage of a new service being offered by UMF: soil analysis. Now, what is for many their first time ever, producers are finally able to understand what nutrients their soil lacks in order to more effectively fertilize their field. In fact, without calcium, the soil may only be partially absorbing a fertilizer’s nutrients. Here at UMF, we focus on many different ways to alleviate poverty. One of the ways is to ensure that our clients are not only maximizing yield, but improving crop quality. 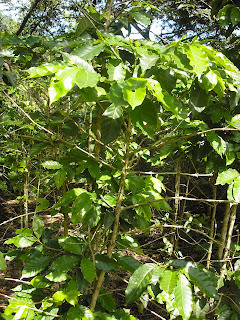 Slowly but surely, our producers are beginning to understand that better coffee can sell for better prices. With better prices, they can earn more profit. Of course, it is not only important for our producers to earn more, but to save and invest wisely for the future. We share our producer’s excitement for the future. 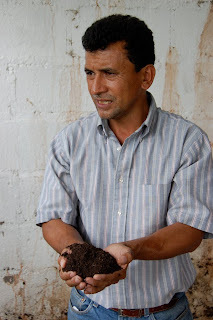 Unión MicroFinanaza is going strong into the next harvest. With even greater knowledge of the local community, we will continue as the trailblazers for rural microfinance. Be a part of our vision at unionmicrofinanza.org/vision. Ask Patrick what he dreams about and you will immediately get an idea of his incredible drive and intellect. While many of us dream whimsical visions, he dreams of chess matches--long, intricate math problems, and other intense problem solving situations. Soon after getting to know Patrick, it is not impossible to imagine a giant Matrix in his head in which data flows endlessly, is placed in algorithms, and is solved for the benefit of all. A graduate of the University of Michigan engineering school, the very same school that Larry Page first dreamed of the concept for Google, Patrick’s logical and arithmetic abilities are hard to match in any circle. Through his example, the entire Unión MicroFinanza (UMF) organization has gained a deep appreciation for how numbers are the foundation of any successful and sustainable endeavor, no matter how great the level of passion. The UMF team is also comprised of a very unique group of individuals and because of this the organization has a very vibrant, but at times, perplexing culture. Each one of us has a special niche in which lay our particular passions and skills. Patrick progressively works to capitalize on these unique talents and bring them together for the benefit of the organization. Before I create an image that Patrick is a rigid mathematician, let me talk about his relational side. Patrick is selfless with his intellect. He was drawn to the villages of La Unión, Honduras, giving up a prominent future in engineering, because he sensed the deep and perplexing problem of poverty. He wanted to do something that made a direct difference in people’s lives and these people became the people of La Unión. In addition to Patrick’s mathematical abilities is his capacity for language. He came to La Unión with no prior knowledge of the Spanish language. Immediately he surpassed many individuals who had studied the language for years and became fluent within three months. Now, as the Director of UMF, he spends a great deal of time with the farmers and people of the villages of La Unión. With the knowledge he gains from these conversations and relationships, he is able to recognize and apply his intellect to solve the problems of poverty that plague La Unión and guide UMF towards success. And that is Patrick, the Matrix, the Problem Solver, the Selfless. The February 21 issue of Time Magazine featured an article discussing the theory of Singularity. Adherents to the theory believe that technology is growing at such an exponential rate that by 2020 computers will outpace the human brain and that by 2045 computer and human will become one single entity. What the researchers of singularity don’t know is that this has already happened. 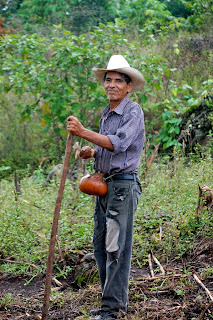 Yes, Unión MicroFinanza (UMF) has their own “cyborg” hidden in the mountains of La Unión, Honduras. While this may be a slight exaggeration, the incredible technological brilliance of UMF staff member Bret Abel is revolutionizing computer programming. Technology is his passion and life blood. If you are around Bret for 10 minutes, you feel like you have seen a glimpse of the future. Bret is constantly plugged-in with the tech community. Whether he is getting the low-down on up-and-coming technological innovations, or creating his own revolutionary programs, he is making a positive impact on UMF everyday. Bret designed and implemented the survey program used to conduct a research study necessary to establish the foundation of UMF. His survey program has since been named Netrix. After learning what Netrix accomplished for UMF, Harvard University bought the program for their research studies. Bret has built the UMF and Micro-loan Coffee website, constructed an interactive template for the organizations newsletter, and streamlined countless other technological processes that facilitated getting UMF where it is today. Bret could be described, even by the technologically savvy, as a computer genius. He graduated with a degree in computer engineering from the University of Michigan. Like many tech people, Bret keeps very different hours than other UMF employees. From 2pm to 3am Bret does things on a computer that makes me feel as though I just painted some great cave art. In all, Bret is a first-rate guy with a tremendous free spirit who is always willing to help resolve technological issues no matter how big or small. And that is Bret; Mr. Singularity, and the Computer Genius. Since then Charlie has taken the entire UMF financial system and revamped it so that everything can be calculated down to the exact penny. It may not be the most glamorous job in the world, but it is invaluable to the organization to have him doing this work for us. Many organizations may have passion and great ideas, but at the end of the day it is the numbers that matter. Knowing the numbers provides the building blocks for vision and is the key to being accountable and transparent. Charlie allows us to do this. he had met in 2005. And that is Charlie Heins: the Man of Meticulous Numbers, and the Invaluable. Michael De Wit, or Vaquero (Cowboy) since his early days in Honduras, is not your high-noon quick drawing cowboy. Instead, he brings an adventurous and investigative spirit, and provides concrete ethics for the Unión MicróFinanza (UMF) team. Mike was on the original research team that set the foundation for UMF. 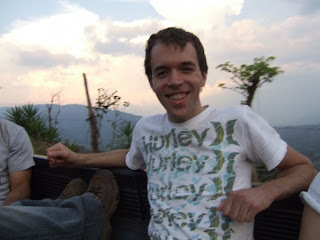 From his very first days in Honduras, Mike wore the traditional Honduran sombrero. While most North Americans look ridiculous in such attire, Mike, with his lengthy stature and distinguished facial lines, pulled the look off remarkably well. If you combine his adventurous spirit and light hearted nature with his stylish sombrero, you get a first class cowboy. Mike has always adhered closely to the research side of UMF's efforts. 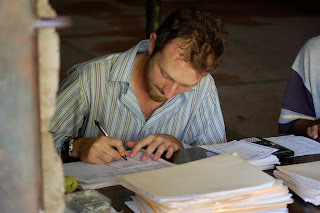 With a background in anthropology from the University of Michigan, it is easy for others to see his keen passion for research. 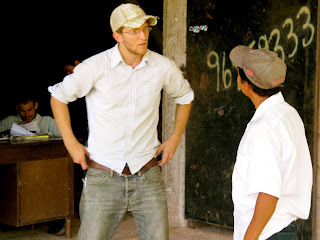 The consequential result of his passion is a caring, calculated, and thorough observational method; motivated by increasing the livelihood of the Honduran people. 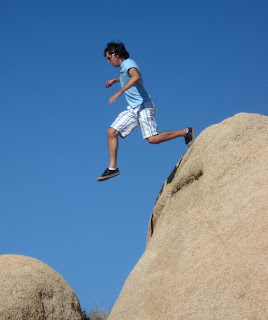 Mike has an intuitively strong sense of ethics that provides a moral compass for the team. Because of his intuition and desire for the application of research to how UMF solves issues of poverty, he can see and understand the short-term and long-term implications of a project. He may be the cowboy, but he is not your reckless, shoot-em up kind. If he was cast in his own Honduran style western flick, he would be the strong, well grounded protagonist who seeks justice on the frontier. Outwitting the lawless foes seeking to create chaos within civil order. 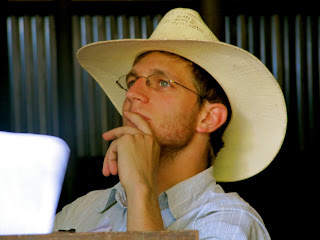 And that is Mike: The Cowboy, the Compass, and the Researcher.